Joseph A. Schumpeter (1883-1950) is one of the most celebrated authors on the economics and sociology of the twentieth century. Richard Swedberg's new biography provides an engaging and vivid account of Schumpeter's varied life, including his ventures into politics and private banking as well as his academic career. As a backdrop to these, Swedberg also discusses Schumpeter's tragic personal life. This book provides a thorough overview of Schumpeter's writings, and also introduces previously unpublished material based on his letters and interviews. Swedberg emphasizes that Schumpeter saw economics as a form of social investigation, consisting of four fields: economic theory, economic sociology, economic history and statistics. The author describes and analyses Schumpeter's theory of social classes and modern states as well as his more famous theory of the entrepreneur. Richard Swedberg has edited and introduced an edition of Schumpeter's texts entitled Joseph A. Schumpeter: The Economics and Sociology of Capitalism (Princeton University Press, 1990/1). 5. Excursions in Economic Sociology. 6. In the United States. 7. Capitalism, Socialism and Democracy. 8. Last Years, Last Work. . Appendix 1: Aphorisms from Schumpeter's Private Diary. Appendix 2: Schumpeter's Novel Ships in the Fog (A Fragment). Appendix 3: Letters by Schumpeter. * Joseph Schumpeter was one of the most important economists of the twentieth century. 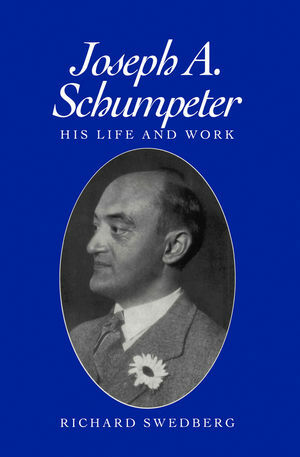 * This book is the first detailed biography of Schumpeter, and is unique in its inclusion of much previously unpublished material from his diaries and personal letters. * The book discusses both Schumpeter's economic and sociological writings and integrates the two in a novel fashion.